I feed my bunnies Bluebonnet rabbit pellets which are supposed to be some of the very best rabbit pellets on the market. I also keep them supplied with good Timothy hay all the time. Be sure to have fresh, clean water available at all times as well. If a rabbit looses just 10% of his body fluid, he can die! Using crocks seems to encourage them to drink more. I like the kind that clips onto the side of the cage so you don't have to worry about them tipping over. We all want to give our bunnies treats! However, it is a good idea to wait until they are close to six months old before you introduce fresh veggies and fruits. And then, I would introduce them slowly and carefully, keeping an eye on their droppings to make sure they don't get some runny stuff going! Their little tummies need time to get the proper bacteria working. Some of the things I have given my bunnies are: carrots, sweet potato, banana, a bit of apple (seeds removed), and parsley. Black Oil Sunflower Seeds are a wonderful treat and help to keep their coats nice. Give them about 1 tsp. a day - they love them! And bunnies love to play! All that time you're sleeping they are looking for something to do. They are especially active at night. I have my cages not far from my bedroom window and many is the night I get up to figure out what all the commotion is, only to discover it's one of the bunnies banging a stick or something similar against their cage! Be sure they have a wooden block or good-sized stick to chew on-they need this to keep their teeth filed down since their teeth are constantly growing! An over-sized PVC pipe makes an excellent play tunnel. I have found mine sleeping inside with just their back end hanging out! I also offer them cardboard boxes to play with. All those Amazon boxes can be re-purposed! They love to have a little house. And then they shred it all up and dirty it so you have to replace it periodically but it's fun to watch. Cardboard oatmeal boxes are fantastic as well! Pine wood shavings work well. You don't want to use the cedar as these can irritate your bunny. Sawdust is not a good options as bunnies are sensitive to dust. Also, whatever you choose to use as a bedding material, be sure to change it out frequently as they can ingest parasites (worms) by sitting in dirty litter. First of all, I have to warn you, I do not recommend keeping Holland Lop Rabbits outside in Texas during the summer! I know of someone who lost 6-8 rabbits on one hot day! If you plan to keep them outside shade is an absolute must! A protected spot for their cage on the porch can work. I would put frozen soda bottles filled with water in their cages as well as a fan blowing on them in the afternoon when the temperatures soar. 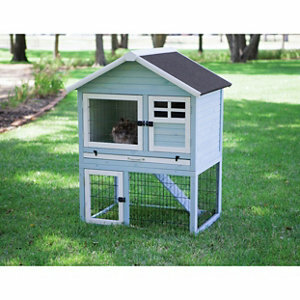 Rabbit cages come in just about every type and size imaginable! So whether you want his house in the living room or on the patio there seems to be something for everyone. I recommend something at least 24"x30" per rabbit. Bunnies like to play and cramping them in a small cage just isn't very thoughtful. I have really liked doing business with Bass Equipment Co. Here is a link for their site. Their cages are plain but they also carry rabbit supplies and are very helpful and knowledgeable if you have a question about cages or equipment. Their customer service has been great! You might also like to check out their portable pens. These can be nice for play time in the yard!​ If you would like to build your own cage/hutch you will find handy accessories for building as well. If you're looking for a ready-made wooden hutch, Tractor Supply has some beautiful hutches! I am intrigued by all the ramps and two-story houses - bunnies love to play! The one pictured is made by Precision and is lovely inside as well with lots of space for a litter box on the lower level. Rabbits are overall pretty hardy little creatures! You will want to have them wormed periodically - maybe every 6 months or so. Talk to your veterinarian for the best wormer to use. ​Trim their claws once every month to six weeks. A dog nail clipper works great! Check their ears periodically for ear mites. You will notice dry scaly looking stuff in their ears if they have mites. I have found just plain A&D ointment or mineral oil works well if you keep up with it. Put a small amount on your finger and rub inside the ear. This will "melt" and coat the mites causing them to suffocate. F or something a little more potent, try Eradimite - Amazon carries it.